Feeling blue? Here are a few tips from a seasoned survivor of many bouts with the blues. The keys are in the word: B-L-U-E.
Are you hungry? When’s the last time you ate? Do you need a change? Does a shower and clean clothes sound good? Do you need some attention? How about some quality time with a good friend or a furry companion? Are you tired? A nap or catching up on some sleep tonight might make a big difference in your attitude. L stands for Leave. “A change is as good as a rest,” my mother-in-law used to say. Change the sights, smells, and sounds around you. Take a walk down the hall. Go outside. Jump in the car or the bus or the train and get out of the neighborhood. When my daughter was an infant, I found that just hanging out with her in the hammock in the backyard was a guaranteed a morale booster — no exertion or car seat required. Later on, long walks with her in the stroller were perfect for insuring a good night sleep for both of us. U stands for Understand. If B and L don’t provide relief, it’s time to start putting your thoughts and feelings in your journal. Let the writing go where it will, into the trivial, into the serious, into the scary — wherever your mind takes you. Putting the thoughts and feelings into words can help you understand why you’re feeling blue. Reading what you’ve written gives your rationale side a chance to offer some compassionate help, and a different perspective on what’s troubling you. E stands for End. With a little help from B-L-U, most bouts with the blues can be turned around. Other episodes are temporary situations — something you’ll spot when you write things down. Although you can’t do anything actively, the problem will go away with time. “And this too shall pass,” becomes a mantra to get you through it. But pay attention, dear reader, because if the blues go on for weeks or months, it’s time to get help from a professional. Depression is not the same as the blues, and even tried-and-true tips like these won’t be enough to put an end to the sadness. Lately, I’ve seen a lot of Facebook posts that portray Republicans unkindly. (Guilty as charged.) However, I think that we all need to remember: not all Republicans voted in their primaries for the Republicans who now hold office. And not all Republicans are okay with what the current administration and Congressional majorities has been doing at the national level. As we approach the elections this fall, the temptation to pass along clever political memes and opinion posts will only grow stronger. If we can choose what we pass along, and maybe spend a minute to introduce the angrier ones, as if we are sending it to someone from the other side, we might reach across the aisle, to the like-minded in other political parties. Let us spend a little time in coming months – not on a crusade to wipe out or demonize the opposition, but in a campaign to encourage the folks who feel under-represented by their political party to get out and vote. If we want the parties to be less antagonistic, and more respectful of each other, while still disagreeing with each other, perhaps we need to show them how it’s done. I used to enjoy visiting to Facebook, to see what my friends were up to. I’d see pictures of their kids, their pets, their vacation spots — and the occasional news article, opinion piece, or quote that they found interesting or inspiring. Social media was a new-fangled way to keep in touch, the way that an afternoon chat was for grown-ups when I was a little girl. These days, if I’m lucky, I still see a few pictures of babies and teens that make me smile, but more often I see pictures of powerful white men that wipe that smile off my face. I read articles about proposed legislation that provoke me into sending political 911s to my elected officials — something bad is going to happen if you don’t stop it! Yes, I know that I could add filters to my newsfeed — a few keywords would definitely change the tone of what I see. But I want Facebook to help me stay in touch with my friends and what they care about — whether they are happy or excited, or outraged or frightened. These are my friends. Friends share. Friends listen. Friends respond. So what is my response? I pray “out loud” daily, posting quotes from the Book of Common Prayer, or its older cousin, the Campaign Prayer Book. With everything going on, prayer seems like the right response. After all, I go to church to pray with other parishioners. Why not pray with friends and family online? 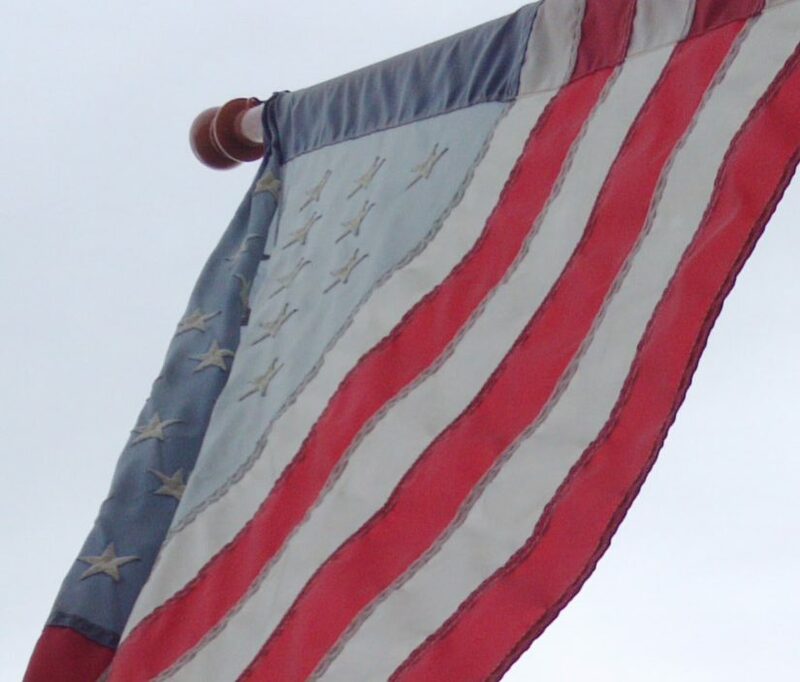 When America’s prestige, power, and glory are under assault, let’s remember that the Lord’s Prayer ends “For thine is the kingdom, and the power, and the glory, for ever and ever.” If someone is all about power and glory for themselves, or even claims it for “us”, we are right to question their motives and their goals. A few years ago, it became difficult to stay engaged on Facebook, to stay engaged with the world, but once I started praying, it became easier. Prayers are the touchstone to my values, an outlet for the angst, and a vehicle of hope, since “for God all things are possible.” Bringing God into Facebook changed everything. My foot surgery was months ago now, and as my mobility improves, things that were important in those early weeks after post-op will soon be dismantled or forgotten. I learned so much before my operation, as I talked to folks who had had foot surgery, I felt well-prepared when the day finally came. Since there is a possibility I’ll need surgery on the other foot one day, so I’m making some lists of things to do and buy now, for that future self, and any reader who may benefit. Note that I tried to minimize special-purpose purchases, knowing that my pack-rack tendencies would want to keep whatever I bought. Also note that while Amazon is happy to supply most purchases, your local medical supply pharmacy (Hornsnyder’s for us locals) is a terrific resource. The 20% off coupons for Bed Bath and Beyond came in handy, too. Make arrangements for extra help, to cover things you normally do. 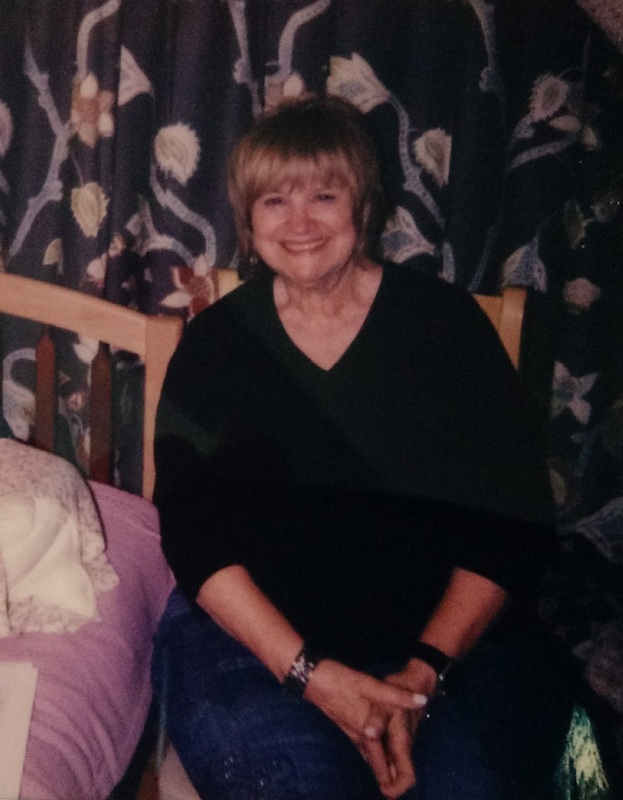 My mother volunteered for this critical role, and we scheduled the surgery with her availability in mind. For two solid weeks, nearly 24 hours a day, she made sure I was fed, had clean clothes, and took my medications on time, in addition to getting my daughter to the bus. Mama also provided that extra support to give me confidence for simple tasks that seemed daunting (taking a shower?! eek!). Thanks, Mama! Decide on what kind of wheels you’re going to use for the non-weight-bearing phase of recovery. 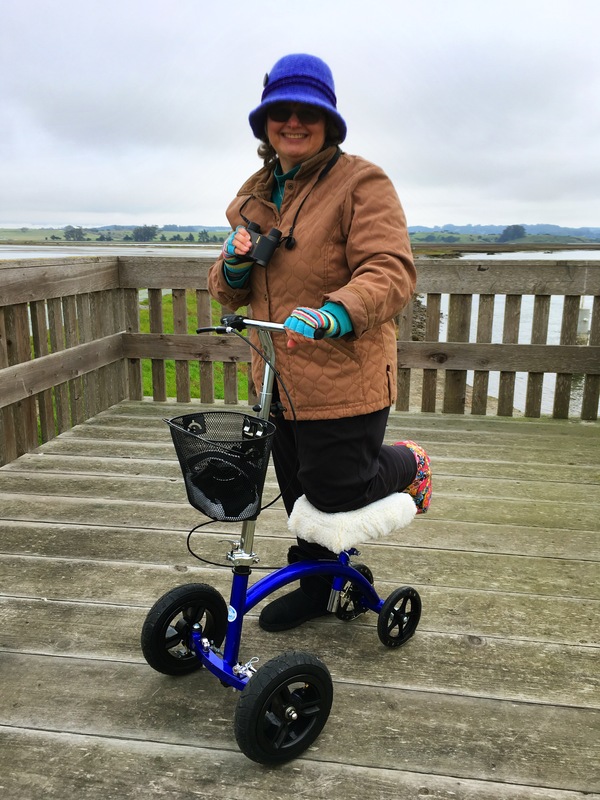 I’d seen a friend on a knee scooter, and chose that (see purchases below), but an aunt used a walker successfully, another friend rented her knee scooter, and a wheelchair would work if your pathways in the house allow. Get ready for crutches. Unless your house has a ramp to get in and out, you’re going to have to use crutches to go up and down a few steps in and out of the house, right from the first day you come home from the hospital. Get crutches, and get lessons — from the doctor’s office, and/or on YouTube — so you know how to adjust the crutches for your height, and how to use them on steps. Your physical therapist will help with this later, but that could be weeks after the surgery date. Take up and put away all of the throw rugs. Those extra surface changes and loose edges require more force to push over when you’re on wheels, and are tripping hazards when you’re on crutches. You can put them back down later, and use this as an opportunity for a little celebratory redecorating if the rugs are looking a little sad. Separate from anyone who is working or going to school. You’ll be up at all hours taking medications, and distracting yourself from pain with some form of entertainment. Being out of commission will be disruptive enough to the family, without adding sleep deprivation to the mix. On the ground floor. Going up and down stairs takes energy that will be in short supply, especially the first few weeks. Then it’ll be up and down on your bottom, requiring arm strength and strength in your good leg. And then one-at-a-time on crutches. Even weeks into recovery, some nights a trip up the stairs is just too much. A chair by the bed. Family members taking care of you and visiting with you will need a place to sit. A bedside table. You’ll want water, phone, tissues, over-the-counter meds, entertainment electronics (tablet, remote control, etc.) and within reach, along with any small snacks that are needed to go with “take with food” medications. Recharging capacity for mobile devices, within reach. I put in lots of hours on my tablet and cellphone, and it helped to be able to plug them in without getting out of bed. Extra pillows to elevate your foot. Molded bed pillows work the best to give a stable platform, and a folded foam pillow can provide the required knee support. Natural light when you want it. Being able to see outside was a real pick-me-up, and while initially I asked others to open or close the blinds, later it was important that I could get my wheels close enough to the window to reach the controls. Set up a recovery bathroom. Usable shower. Our house had a shower on the ground floor, but it needed a bench for me to sit on, a hand-held shower head, and something to hold my soap and shampoo. 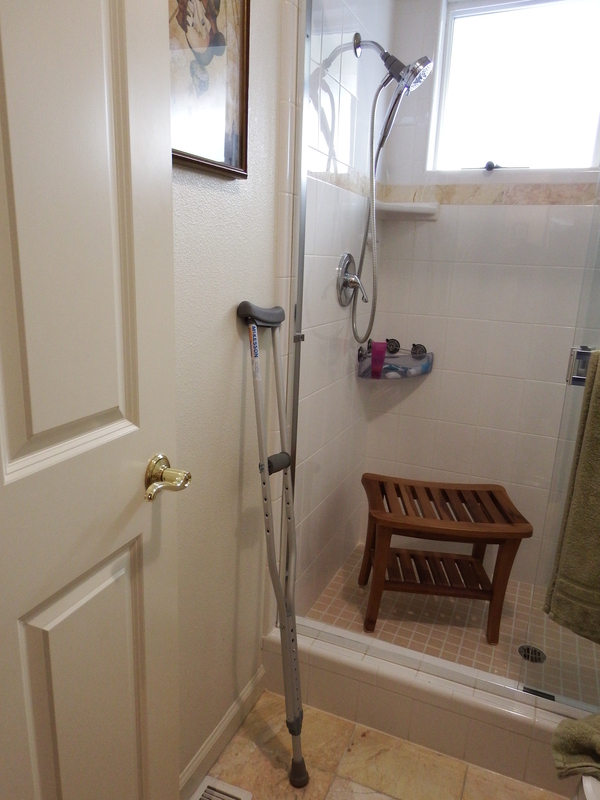 Our shower had no grab handles for getting in and out, but I found that one crutch, braced against the edge of the tile, and the second on the other side, were sufficient. (A suction cup handle we tried wouldn’t stay attached to the tile.) This is one place where your local medical supply store may have the best solution for your situation. Your personal toiletries. Everything you’d put in a kit bag for a long trip, needs to be in this bathroom. It helps build self-confidence, to be able to do normal things, like brushing teeth and taking vitamins, without extra trips around the house. Easy toilet access. Getting a raised toilet seat was suggested, and one with arms would have been nice, but I found that I could get up and down just fine using a crutch and the counter for support. A privacy curtain. Our ground floor bathroom was small, and I couldn’t close the door with my wheels inside. This was easily remedied with a compression rod, and some lightweight curtains from another room. 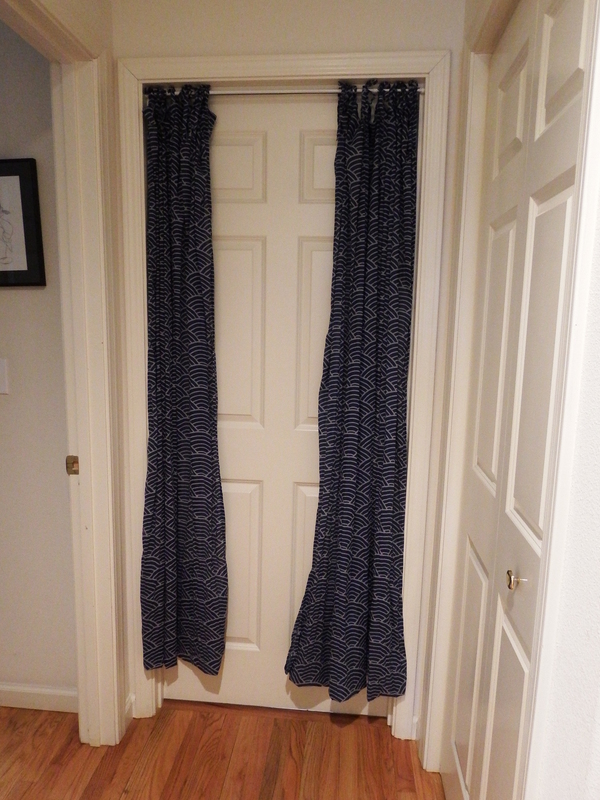 I basted the hem to be above the wheels, so the curtains wouldn’t catch as I rolled in and out. Put together your recovery wardrobe. Favorite tee shirts are good for morale, and can help to spark small talk in the doctor’s office. A few simple long-sleeve tees or mock turtles in favorite colors are good, too. They can be dressed up with a scarf, for trips to church or other places where slogan tee shirts don’t suit the occasion. Large, soft socks. The skin of your foot can be very sensitive for weeks after surgery. You likely won’t be able to pull covers over it, so a sock will keep it warm. There are lots of soft socks out there, but often they are for diabetics, so they are a little tight. Knee socks would be nice for wearing under the walking boot, but be sure they fit over your calves. Bottoms with wide leg openings and elastic waistbands, and more shorts and capris pants rather than long pants, will help in getting things on and off with a big dressing, a cast on your foot, or sensitive toes that don’t appreciate pushing against denim. A cast cover to protect your pillows and sheets. The dressing is soft, but cast put on later is very rough, and will abrade your pillow cases and sheets and blankets. 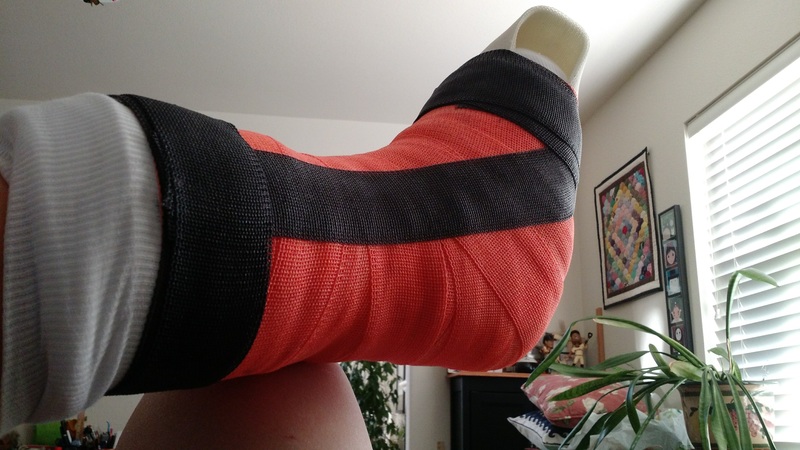 You have to wait until the cast is put on, so you know the exact dimensions, but my cast was about the same size and shape as the dressing. I got mine online, but the local medical supply has them, too. CastCoverz has loads of nice fabrics, from wild to mild. I went for a wild one. Get your normal shower ready for a slippery foot. The tiles on our shower floor had always seemed grippy enough before surgery, but part of recovery includes putting lotion on your foot to keep the taut skin pliable. You may, later on, be prescribed an anti-inflammatory lotion as well. Those lotions will make your foot slippery, so that getting in and out is feels treacherous. We ended up getting two loofah-style bath mats to cover our shower floor. Locate (or purchase) a trekking pole, or a pair of trekking poles, or a cane that you really like. At some point, crutches will be more support than you need, and more bulk than you want. The little extra support from a cane or pole helps to get up and down when you’ve stiffened up, helps keep you moving with a more normal gait, and takes up less space in your car and in restaurants. We did spend some money to make things easier during the recovery. There were ad hoc purchases here and there (e.g. compression rod, extra shorts, socks), but the ones below required more shopping research and/or assembly. Wheels. My friend’s scooter was loaned out to another friend, and renting one was going to be as much as buying, for a clunkier model, so I bought my own from Amazon and assembled it. It had a basket, essential for carrying things around, and also had an extra set of”off-road” wheels for outings on rough terrain. I also spent extra money for a sheepskin cover to go over the vinyl seat. The cover didn’t add much cushioning, but provided a way to secure an extra layer of padding, and could be removed when I needed to use the seat as a footrest. Hand-held shower head. The “recovery bathroom” had a regular fixed shower head, but as I’d be sitting, I needed one that I could control. The one we chose from Orchard Supply had a strong magnetic mount, that made retrieving and replacing the shower head much easier than a hook would be, for someone sitting down in the shower. Shower seat. We chose a teak bench from Bed Bath and Beyond and outfitted it with rubber feet that provided just enough traction so the bench wouldn’t slide on the tile when I sat down, but still allowed me to push it across the tile for better positioning inside the shower. This bench looks nice enough to serve elsewhere in the house, once I don’t need it in the shower. Ottoman. I wanted to prop my foot up, without any weight on the injured area before surgery, and the healing area afterwards, while seated on the couch. 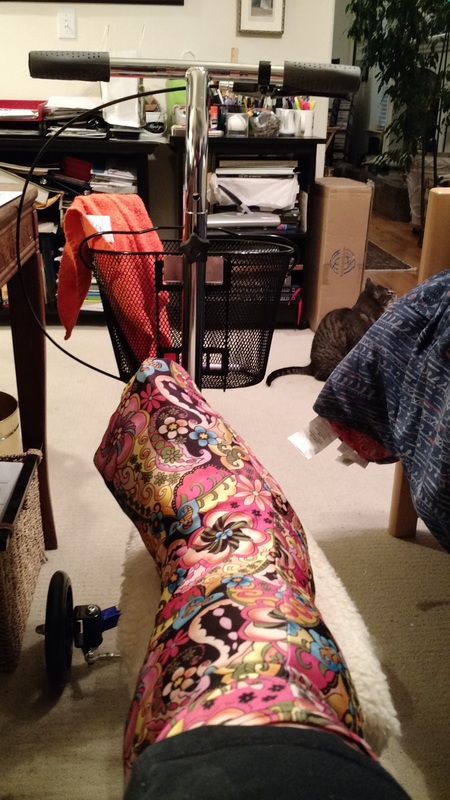 We didn’t have an ottoman in our living room set, or a recliner with a built-in footrest, so I found an ottoman at Pier 1 Imports that worked with our decor, and was cheerful, to boot. For accessibility legislation that has provided handicapped parking spaces, wide enough to allow me to get in and out with my wheels. For disability insurance that has provided funds to help keep the household financial wheels on, while pain and fatigue have put job hunting, interviewing, or working, beyond my capacity. For mobile technology on my tablet and phone, which have allowed me to stay connected and entertained, without requiring me to get out of bed. And finally, future self and friends who are about to have surgery, remember this: It will be painful, but medication will help. It will slow you down, and keep you from doing things you want to do, but be patient with yourself (remember this meditation talk?). Healing will come. You can do it. In summer 2016, I joined the leadership team of a Christian meditation group that I attend regularly on Saturday mornings, upon invitation by Tom Lehmkuhl. Tom was a founding member of the group and is a Benedictine oblate with a charge for Christian meditation. Tom invited me to help at a second group as well, but I couldn’t make it to their Tuesday morning timeslot. As it happened, a few months after Tom’s invitation, I left my paying job. One of the things I looked forward to during my self-funded sabbatical, was the opportunity to join Tom’s second meditation group. This week, I gave my first talk at the Tuesday morning meditation group. In celebration, I’m launching a new area of my blog, to archive the talks and music played as the interlude preceding each talk. If you’re already meditating, hopefully you’ve already found a meditation group. Meditating with others is very supportive — just like praying with others. Hopefully reading these talks will also encourage you in your meditation practice. If you haven’t meditated before, I recommend that you give it a try. You’ll need a mantra (also called a “mantram”). Tom Lehmkuhl recommends “Yahweh”. “Maranatha” is also recommended by spiritual leaders. Eknath Easwaran’s philosophy on choosing a mantram is a good resource before making a decision. Meditation at home and in the two groups has brought much peace and encouragement for me. Now, leading these meditation sessions brings me much joy, as I write them, choose the music, and share them with the others. By posting the talks and music links online, I hope to pass these blessings along. I read an article this morning that bemoaned the increasing distrust Americans have of the news media. At first, this seems scary. We as a nation have relied on Freedom of the Press for decades, relying on the news to educate ourselves, so that we might perform our civic duty at the ballot box. If we distrust the news, who can we rely on to educate ourselves? Looking closer, this distrust may be a symptom of a healthy electorate, much like a fever in someone who is ill. After all, editorial decisions made by this station or that newspaper, even when reporters are covering the same events, can change our opinions. Just compare the Wall Street Journal, the Washington Post, a local Fox news broadcast, a local NBC news program, and NPR radio on the same day. Not only is the same news reported differently, with different headlines, but you can see what is not being covered, as yet another editorial decision. Isn’t distrust an appropriate response? Yes. And no. Like a fever that has gotten too high and gone on for too long, there’s a point where the healthy response becomes dangerous. We need the media to help us be aware of what is going on in the world, and to distill it down into digestible pieces, yes, even sound bites, so that we can make informed choices. But we can’t delegate the role entirely to one source. Remind yourself that your experience of the world will define your world view, and other Americans are limited by this same reality. What I experience in my county is not the same experience as someone else fifteen minutes away in the same county — much less someone half way across the country. This is not “right” and “wrong” — this is just reality. When your news sources are completely in synch with your experience of the world, Fix It. Start reading articles from other friends. Read another newspaper, watch a different channel, or listen to a different radio station — not exclusively, but enough so you can hear the voices of people in different neighborhoods, who have different experiences. In the end, We The People need to be an informed electorate. If we allow our distrust of the media to turn into demonization, if we only listen to voices that have our own world view, then We The People will have a much harder time working across the aisles and zip codes, to find solutions to the problems we all share. I believe that God is at work in the world, and the Holy Spirit is working within us to be where we’re supposed to be, to do the things that need to be done, to serve, to love, and to learn. That last part, to learn, is the hardest thing, I think. I like life to be nice, comfortable, and easy, and people to be friendly and kind, and for them to come to the same conclusions that I do. But that G-rated world is not the real world. The Holy Spirit has some hard problems to tackle, in places that aren’t pleasant, with people that might be friendly and kind in some circumstances, but are quite antagonistic in other situations. How are we, the hands and body and feet of the Divine, going to help with those hard problems, if we don’t get some practice with things that aren’t nice, or comfortable, or easy? After all, with enough practice, we’ll discern which types of problems we’re good at, which problems suit others’ talents better, and which ones we never knew we could meet head-on, grounded in our faith. People who know me will know that conflict is out of my comfort zone. It’s not getting much better with age – I have to send my daughter and husband to the movies without me sometimes, if the conflict is going to be too intense. But over the years I’ve also learned that in situations of real-life conflict, I can trust that the Holy Spirit is at work. I might not enjoy it — I might rather crawl into a hole and pull the cover over my head – but with God’s help, I can be present, breathe, and listen to the other person, and then respond in a way that is grounded in the commandments – Love God, and Love Your Neighbor. And lest I forget, and get too sure of my position or point of view, I also remind myself that I too am part of the world. I just might be part of the problem that the Holy Spirit is working on.